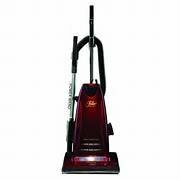 Built tough to offer years of service, the Fuller Brush Mighty Maid features metal components from the handle to the bottom plate. When you need convenience, the At-the-Ready on-board tools reach way beyond expectations. Plus the HEPA filter keeps the dust in the vacuum where it belongs. With the Mighty Maid vacuum, cleaning your home from top to bottom has never been easier! Features a headlight and 30-foot power cord.